Using the clear, concise, and compelling language he advocates, Simon Hertnon quickly transforms you from being someone who merely communicates, to someone who understands why you communicate and why your audience does — or does not — respond as you wish. The majority of this inspiringly short guidebook teaches you how to write successfully, but not before teaching you the all-important principles that apply to all forms of communication. Clear Concise Compelling is the course book for Writing Essentials. Here’s a book I devoured. I commend it. It is such an excellent, excellent book. Fantastic. Sure to become a prescribed text and an induction pack staple. 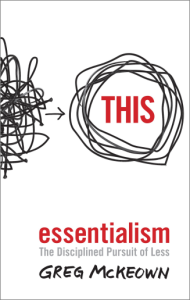 It is really clear and really concise…very worth having a copy for your teenagers, at work, wherever. 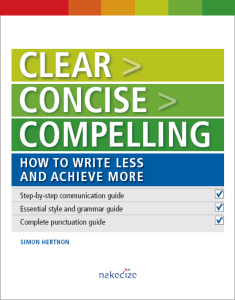 Title: Clear, concise, compelling : how to write less and achieve more / Simon Hertnon. Format: 80 p. : col. ill. ; 24 cm.